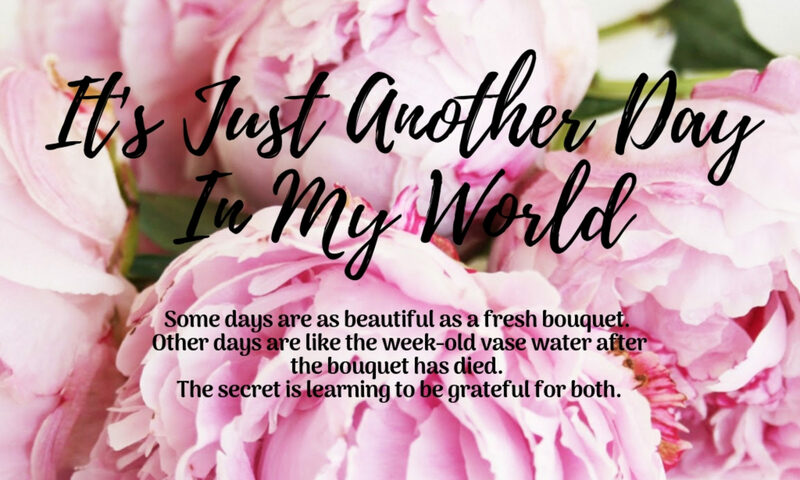 It's Just Another Day In My World – Page 16 – Some days are as beautiful as a fresh bouquet. Other days are like the week-old vase water after the bouquet has died. The secret is learning to be grateful for both. That is the question that I fear most in social settings. I’m often tempted to lie and tell people I’m a stay at home mom. Or a stripper. But I don’t. Because telling the truth is in the rule books in my profession. They tell me how much they love their church and how their VBS reached 9,003 kids last year. They start confessing how long it’s been since they’ve been to church and why their lives are so busy that they just simply can’t fit church in anymore. I wish it didn’t make people feel awkward. I’m really just a glorified party planner. One who throws parties where Jesus is the theme. I throw these parties every Sunday morning and then once a year we do a sort of Jesus-pa-looza called vacation bible school. I don’t judge other families for being busy. I don’t judge people who have missed a Sunday or two. Or sixteen. I simply make sure the party is fun and safe and that families feel welcomed and loved. At least that’s the goal. I try to create a space where people can join with other people to learn, love, and enjoy each other. Yes, we read the Bible and we teach the stories. That’s not to make people feel bored or guilty or squeamish. It’s because God, in his infinite wisdom, recorded the stories of lots of other people who believed in him. Or wanted to believe in him. Or were thinking about wanting to believe in him. Most of those people made mistakes. Big mistakes. And most of them learned lessons. So we read the stories in the hope that we can learn from other people’s lives. It also helps us to see that God has always been a stand up guy who takes care of his people. I’m proud to be a children’s minister, a church worker. If I wasn’t I’d probably go with the “stripper” line more often, although I don’t think anyone would buy it. I’m grateful that God has called me to be in this position in this time. I pray every day that He will work through me to bless others even though that sometimes makes for long, awkward pauses and fumbling of words. And I pray that his Spirit would go before me each day so that the path would be clear and the conversations would be plentiful. I find this interesting because I have questioned my purpose for many, many years. I believed for a long time that God was preparing me for some amazing moment, a moment when all the stars would align and all the experiences of my life would come together in one mystical instant. In this moment I would know my purpose, set forth on a path of righteousness, and lead the world to….to…well, that was the part I had been waiting on. I don’t believe that any more. I think that those moments may happen for a few. The writer or actor who is suddenly discovered. The singer who gets that big break. I’m sure it happens for some, I’m just not sure that my purpose will be revealed with fireworks. No, I’m starting to believe that my purpose is revealed in tiny pieces, like puzzle shapes that fit together after much searching and deciphering. I believe that God has given me gifts and talents to use today. I think I have a responsibility to sharpen those talents and share those gifts to bless people I encounter. When I look back at my life thus far, I can see how God has molded me and moved me through the circumstances of my life to prepare me for the next step. I can see how He has allowed me to grow and flourish and change. I can see how he has humbled me and lifted me up and allowed different flecks of color in the mosaic that is my soul to shine and darken, reflect and deflect, for each situation and encounter. What is my purpose? I suppose it is to stay as close to God as possible so that I can be ready for whatever and wherever he leads. My heart broke this week when I learned that Pastor Rick Warren’s son had committed suicide. I, of course, don’t know the Warren family personally. I only know Pastor Rick as somewhat of a celebrity and as an author. I follow him on Twitter and had read several of his books, his most famous being “The Purpose Driven Life”. The Warren’s had never talked about their son’s mental illness before publicly, wanting to allow their son to tell his own story in his own time. Pastor Rick has said in recent days that, “We always knew that God would use us to fight mental illness but we were protecting Matthew’s right to share his own story.” Now his story is their story. That’s how it is for those of us who are survivors of suicide. Choices that someone else made become our path, our story. The friends and family members who are left behind have to pick up the pages, turn them, and start anew. We walk through the pain that they could no longer carry and pray against the demons that would not let them rest. This Monday, April 15th, will be fifteen years since my own mother committed suicide. My kids, age 7 and 9, have started asking very pointed questions lately about her death. I have never wanted to lie to them but the words have never come easily and I never wanted to bombard them with more truth than their little hearts and minds could process. My explanation has always been that her heart was so sad that her mind became ill and she died. That truly is the most elementary explanation for now and I will continue to pray for God’s Spirit to speak through me as they seek a deeper explanation. There is such a shameful stigma around mental illness and suicide in our society. I pray often that I will have words to speak to others when they ask about my mom. I pray that God will work through the Warren Family, and also through me, to bring light to the reality of what it is. It is a sickness. It is an illness. Sometimes it is brought on through tragedy or circumstances and sometimes it’s brought through no apparent reason but it deserves to be talked about and treated just like any other illness. So today I pray for peace. I pray for the Warren Family that they may experience God’s peace like a blanket wrapped around them in soft comfort. I also pray that peace for myself and for all the friends and family who miss my mom, even still after 15 years. May we never forget the love she shared with all of us and may we continue to honor her by loving and giving to others. My husband’s maternal grandmother died this weekend. We got the call on Easter morning around 4:00 AM. She was 90 and had cancer so it was not unexpected but yet it was. Granny O was such a fiesty fighter that when we found out about the cancer I still thought, somewhere in my deepest thinking places, that she would beat it. Easter is a busy day for us, with me being a church worker and all. It means lots of time at church, lots of greeting, and lots and lots of smiling. Granny’s death made it a little more difficult to be so smiley but the thing that kept me going was the knowledge that she’s with Jesus now and no longer suffering. You hear people say that upon a death but it really is true. That hope and assurance is the one thing we can hold on to. And I have to believe that if you’re going to enter the gates of heaven, there couldn’t be a better day than Easter. I can only imagine that the angels sing a little bit louder on that day and that the gold and silver are freshly polished. So while we are sad to no longer have Granny here on earth with us, it is truly heaven’s gain and we look forward to the day when we will see her again. We had to replace our air conditioning units and furnace this spring. It was time. In Texas, you go through air conditioners like people in the north go through snow shovels. We use them a lot and can go back and forth between furnace and a/c several times in one week. This morning was one of those, “Let me turn off the air and turn on the furnace” mornings. It was 62 in the house and I knew that my kids were going to fight me on getting out from under their covers. I got out of bed, before the sun was up, and quietly crept up the stairs to turn the heat on. It revved up beautifully and quietly and…wait, what’s that smell? The smell of “newness” started pouring out of the vents. It was a smokey, greasy smell and was putrid. That wasn’t the worst part though. Suddenly the smoke detectors started screeching. And because they are hard wired into the security system I couldn’t turn them off. My kids both jumped from their beds screaming. My son was crying and his little hands were over his ears. The dog started howling and running up and down the stairs like his tail was on fire and all I could do was stand there with my mouth hanging open. I finally convinced the dog to go outside while the kids hid under the covers of their beds. The smoke detector finally turned off and everyone calmed down. I called the air conditioning company who assured me this was normal and fine and would not stink forever. The kids got dressed and headed out the door, I drank a gallon of coffee, and our Monday life got back on track. I find myself praying for my kids ever more frequently. When they were babies I prayed that they would sleep through the night and that they would not die in their sleep. I prayed for fevers and ear aches to go away. I prayed for rashes to clear up and for coughs to break loose. I still pray those prayers, except the death by sleep one because we grew out of that one when we gave up the crib. Now I have added new ones. I pray that they would listen to their teachers while at school. I pray that they would be protected on the playground. I pray that they will only have kind and honest friends. I pray and I pray and I pray. The point is that I keep praying. I don’t know how to do this thing called “Parenting” any other way.